Other priorities prevented me from examining the New Zealand government UFO files at the time of their recent release. So I had a cursory look and saw the various reviews. It was however Dr. Michael Swords' excellent blog "The Big Study" post from September 14, 2011 "More Than Meets the eye with Moreland??" that drew me back to the New Zealand files with an enhanced level of fascination. The files revealed that there was indeed much more to the classic Eileen Moreland CE3 incident. All previous material on the case had revealed this New Zealand case from 13 July 1959 as a striking low level UFO encounter in which the witness Eileen Moreland had observed 2 entities inside, seemingly "encased in silvery suits.... (with) headgear ... like divers helmets which glittered very brightly. They appeared to be normal sized people." One of the figures appeared to stand up and lean forward on its hands , possibly examining something between it and the other figure. The entity then returned to its original position, the object tilted slightly and started to rise, disappearing at high speed into cloud clover. The early morning encounter was apparently short lived but may have had some enduring effects. Fred and Phyllis Dickeson reported the case in their NZ Scientific Space Research Group Journal soon after it occurred. It was a case that would split the tight pro-Adamski group alliances that were a dominant force at the time. 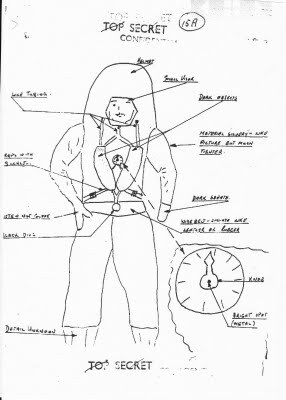 The case and sketches based on material from Mrs. Moreland, confirming the limited entity features, were reproduced in the special 100th issue of SATCU XENOLOG magazine in 1975. 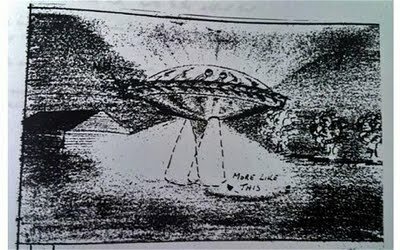 The Dickesons' son Bryan revisited the case in the Australasian Ufologist magazine in 1999, but again the details were basically the same as reported in 1959 and 1975. I described the case in my 1996 book "The OZ Files" as I saw it as a striking case, happening so soon after the famous Father Gill Boianai Papua New Guinea events. With the December 2010 New Zealand government UFO file release there were file holdings on the Moreland case, along with quite a number of pages blank with the typed explanation: "This document has been withheld from release to the public to preserve personal privacy in accordance with the official information act section 9 (2) a." The attached vetting statement for File number 244/10/1 Vol. No.1 elaborated, "While downgraded place caveat on Privacy/Medical grounds - informant was given assurance of confidentiality. Informant was 42 in 1959 so born 1917. Apply 70 years from last sensitive document = 1979. Public release 2040." The main body of the Moreland papers, with the censored folios, still revealed fascinating further detail, and tantalising allusions to sensitive details. In fact as the 1959 investigation progressed the CONFIDENTIAL classification had been changed to TOP SECRET. A close reading of the folios and material showed the case was drawing renewed media and researcher attention in 1979 which highlighted fascinating dimensions to the case. Mrs. Moreland's case file included her initial statements and drawings given to the local Blenheim police. There is 2 page statement she gave to Commanding Officer Group Captain A.P. Gainsford of Royal New Zealand Air Force (RNZAF) Station Woodbourne. He appointed Flt. Lt. C.M. Jennings (Tech(E)) to receive all information and conduct further investigations as required. Flt. Lt. Jennings "had no previous interest in matters of this nature and commenced his task with an opened mind," according to Gp Cpt. Gainsford. Based on officer Jennings' investigation and "of the matters revealed (apparently only known to Mrs. Moreland and officers Gainsford and Jennings) the classification of the material" was raised "as a pecautionary measure." Because of the symptoms reported Mrs. Moreland agreed to confidential medical testing at the military station. It was also determined that radiation testing would be undertaken. Commanding officer Gainsford added in his 20th August 1959 communication to the Air Department in Wellington, "Flt. Lt. Jennings has spent considerable private time on this matter, is convinced that Mrs. Moreland is genuine, and is an extremely worried person. He is prepared to turn out at any hour of the day or night to personally investigate further incidents." Officer Jennings undertook a detailed interview with Mrs. Moreland on 23 July 1959 preparing a 5 page hand written report. Therein annotated to his conclusion that, "Mrs. Moreland gave every evidence of being completely sincere ..." Jennings apparently later added "Can I get more out of her??" Well, later evidence detailed from 1979 internal RNZAF commentaries certainly revealed that he did indeed get "more" out of her, and it was this material that changed matters for the military, raising the investigation to TOP SECRET, but the actual documents involved were censored from the 2010/11 file release. What remained in the immediate 1959 folios were tantalising. Folio 15A shows a human type figure in a bulky suit with the large helmet described in the earlier material, but now with some suggestions of facial detail, and various items shown (see the TOP SECRET sketch). Officer Jennings various "NOTE FOR FILE" folios that are uncensored refer to the medical for Mrs. Moreland was for the purposes of checking "for exposure to radiation." Further they mention than on Thursday 13th August Mrs. Moreland had again detected the "smell of burnt pepper" that had been noted during the 13th July encounter. Officer Jennings was planning to visit the area the following Thursday "at about 0330 - 0400 hours and remain until daylight. I shall take a geiger counter with me." There were other sightings in the wake of the original encounter, but only one reference was noted in the 1959 folios to a possible corroborating event on the same early hours of 13th July. A Mr. Haldaway (sic?) about 3 miles east of the Moreland property at about 0430 to 0500 hours reported being awake and seeing "a bright light shining through the window .... (which) appeared to be of a whitish orange colour." The light reached "a high intensity and then gradually faded away without any accompanying sound." The witness thought it might have been car lights but the absence of sound appeared to have negated that thought. This observation was reported by Flt. Lt. Young of RNZAF Station Woodbourne to Sgt. H. Fulton of RNZAF Station Whenuapai, as well as a comment that "the grass field" in the Moreland incident "has not become discoloured and has not been ploughed since the event nor has Mrs. Moreland been unwell since the incident." Sgt. Fulton was director of a civilian UFO group, C.S.I. We have to move on to 1979 folios in the NZ government UFO files to get some of the other more tantalising details. A civilian researcher Colin Emery had pressed Mrs. Moreland and the Ministry of Defence for the release of files on the Moreland case, citing a coverup, and claiming "the government has had confirmation of the sighting from the Air Force and (was calling) for the findings to be made public." The official files do not reveal what Amery's "confirmation" consisted of, but this aspect is alluded to in Peter Hassall's 1998 book "The NZ files - UFOs in New Zealand" “(Amery) received information from two sources who refused to be identified. They both worked at Blenheim’s Woodbourne airbase in the 1950s and had been sworn to secrecy. One claimed that the wife of a squadron leader heard a jet engine-type noise between 5.30 and 6.00 a.m on 13 July 1959. Checks later showed no aircraft had taken off that early. Had she heard the UFO Mrs. Moreland saw as it departed? The other retired airman said he saw a blue light that descended from the sky about 5.00 a.m. the same morning. He reported it to his superiors after the furore broke over Mrs. Moreland’s report. Twenty years later they were still too scared to speak openly due to the possible legal penalties.” Mrs. Moreland’s encounter took place between 0530 – 0545 on Monday 13th July 1959. “On 13 July 1959 a woman living near Blenheim reported that she had seen a flying object which behaved in an unusual way. Lets hope the New Zealand MOD respond to rational enquiries and release the full details of the Moreland files. Times have changed and the fears of 1959 and even 1979 have ebbed away. Time enough for a fuller disclosure. If Mrs. Moreland is still with us, the sentiments expressed by her in 1979, steep in the concerns of ridicule and confidentiality, may not be as concerning as they were back then. Also I wonder who was the Air Force person who reported the sighting? Is it something that the earnest and worried Flt. Lt. C.M. Jennings could enlighten us on in his investigations and nocturnal return visits to the Moreland farm? When I read the curious detail that described the entity Mrs. Moreland encountered as having no left hand, I immediatedly thought of the strange entity reported in the bizarre Carl Higdon abduction which occurred in Wyoming during 1974. A detailed account of this weird affair was provided by Dr. Leo Sprinkle in "UFOs and the Behavioural Scientist" (1979) edited by Dr. Richard Haines.